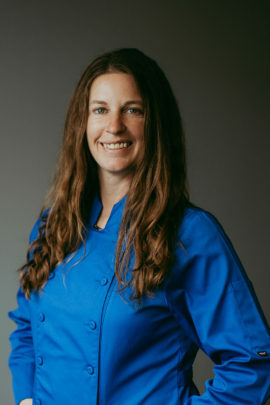 Meet Blue Coat Chef Mariah. She’s been a valued member of the Blue Coat Army and a beloved member of one of our Delta Delta Delta chapters since 2016. Mariah channels the thoughts of her culinary idol, Anthony Bourdain, when she creates delicious meals for her sorority. She enjoys creating dishes from all over the world and she loves working in a sorority that allows her the opportunity to try new things. She received her culinary training from the Inland Culinary Academy. A little known fact about Mariah, is that at one of her previous jobs, she made breakfast for Shaquille O’neal, and you better believe it was a feast!